Your Stone Island Adventure starts off with a one hour boat tour around the area of Mazatlan to see the lighthouse & its caves, Bird Island, sea lions (seasonal), and the fishing industry while being entertained with music and enjoying an open bar on the sundeck or in the shade. You will have about three and a half hours on Stone Island where you will have lunch, relax on the beach or enjoy some of the various beach activities available such as horseback riding, kayaking, banana boat ride, & snorkeling. 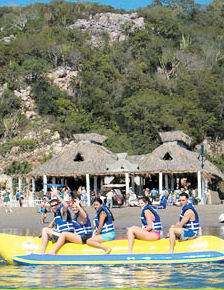 You will have your choice of two beach activities as part of this adventure. Be sure to bring you sunscreen, swimsuit, beach towel and camera. Please note drinks onboard the catamaran include soda or juice and drinks on the island are beer, soft drinks and a tropical cocktail of vodka, rum, and tequila. There is no charge for children 3 and under for this excursion.